Home→Blog→Food Plot Seed Labeling…May Surprise You! 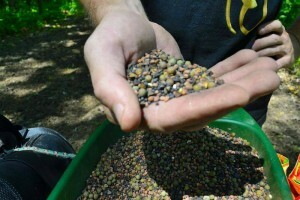 Food Plot Seed Labeling…May Surprise You! Although planting season is almost 3 months away, we can’t help but look ahead with excitement to get the first seed of 2016 in the ground! When you make your food plot seed purchases this Spring you may or may not pay much attention to the Seed Label on the bag which provides the LOT#, Seed Varieties, % of each seed and germination rates. This label offers insight into what you are actually getting in each bag of seed…we urge you to take a look at this label when making your purchases so you’re getting exactly what you are looking for….because what is actually inside the bag may not always be what you expect! Seed is actually sold by the pound and because seed varies in size, weight, density, and shape, there will not be the same NUMBER of seeds per pound for EACH variety of seed. For example, there are approximately 2,750 soybean seeds in a pound of soybean seed, whereas there are approximately 776,000 Ladino Clover Seeds in a pound of Ladino Clover…..just think how many clover seeds are in a 3.5 lb. bag of Trophy Clover Mix!! Your immediate reaction is that if you plant this mix, you will have a food plot full of oats with an occasional Canola or Turnip plant. In reality, there are approximately…. In the case of Lights Out Forage Oats, the end result of this food plot, if every seed germinated, you would have a plot that is 38% Triactor Oats, 33% Wizzard Canola, and 29% Purple Top turnips….not just a field full of Oats, but a field loaded with Oats, Turnips and Canola and a food source all Fall and Winter. All of our seed mixes are designed with a few things in mind…provide you the highest quality seed mix possible that will provide maximum attraction, forage and nutrition for a healthier deer herd! We’ve worked very hard for the last 28 years combining research and science to help you become more successful deer managers and deer hunters and we will continue to work hard to provide you with the highest quality products available. I hope this provided a little more insight into Food Plot Seed Bag Labels as you begin to lay out your plan for the upcoming Spring planting season. If you have further questions or want some additional insight on setting up your property for success please contact us and we’ll be happy to help. Thank you for choosing Antler King Food Plot Mixes! i think your math is wrong or you are putting less Canola & Turnip seed in your 12 lb bag than in your 1 lb bag ?? shouldn’t it be 5% not .05% ?? No problem Dave, thanks for reading.